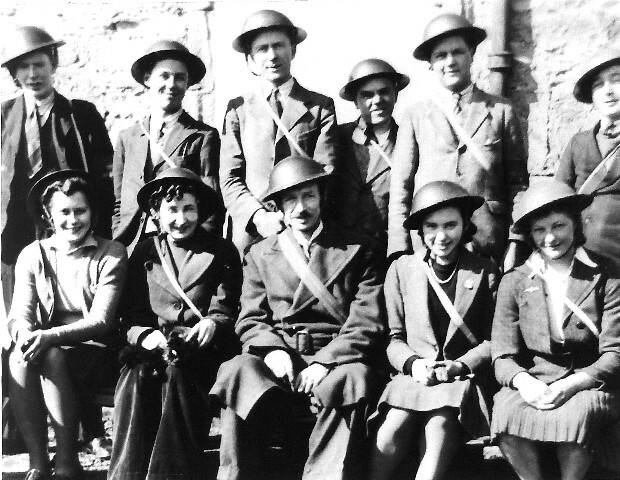 A. R. P. Wardens in the 2nd World War. Back Row: ? Murdoch, ? MacKenzie, Duguid Ross, John MacMillan, Gordon Wilson, Donnie Hendry (both Donnie and George Jamieson, who is not in the picture, were the messengers). Front Row: Agnes Borley, Chrissie MacKay, Walter Henry George, Elma George, Marge Chapman. Thank you for your comment - as Duguid is fourth from the left, not third, do you have any idea who is third from the left - John MacMillan? Duguid is fourth from the left, not third. When the sirens went, we grabbed our gas masks and ran along to Oaks Villa (the wireless operating base?) ready for casualties. Luckily, there weren't any during my shift! We were trained in first aid, and remember lying on the ground learning how to wash mustard gas off casualties that might arise. Sorry, Malcolm, we're not sure. Oh yes - Duguid - remember him well, and he also took a number of photos of our family over the years. If I rember right, he lived in Shore Road, with his two? sisters. I think Duguid lived in Outram Street. Nope, Duguid lived on Shore road, in one of the council houses, same one as the Walkers but around the back. Agnes Borley was my auntie. Her son Torquil Cowan now lives in Wales. Duguid lived on Shore Road opposite our house and with the Innes's living above him. Doug, you are absolutely right re Duguid's home. I well remember him with that big camera bag slung over his shoulder off to see a football match or whatever. Duguid is instantly recognisable despite last seeing him over 50 years ago. I remember his big camera. I guess it must have used glass plates and the quality would have been very good. I have asked this on the site before - does anyone know where his films are? He must have had a huge archive of pictures covering anything and everything that happened in Inverg. First on back row is Hector Murdoch, I lived across the road from him on Clyde Street. Who was the council at the time of WWII who was overseeing the housing stock, including the prefabs that were put up in Joss Street, and the Anderson shelters? I am one of those that attend on a Thursday evening in the museum.